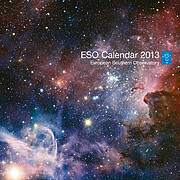 Building on the success of past years, ESO has produced a 2013 edition of the ESO Calendar. This was one of ESO’s most appreciated print products in the past and the new edition is now available as a free PDF file for download, or for sale in the ESOshop. Each month showcases one of ESO’s best vistas of the southern sky from 2012. These also include impressive images of ESO’s numerous telescopes, silhouetted against the remote Chilean landscape, that are guaranteed to catch the eye of visitors. Each image resembles a piece of art, contrasting the natural environment that surrounds ESO’s sites in Chile with the human-built observatories and telescopes used to scrutinise the heavens. The calendar’s highlights include the picture for the month of September, which features the beautiful cosmic bubble of the Thor’s Helmet Nebula — a target that was selected and observed by members of the public for the first time ever using the Very Large Telescope, as part of ESO’s 50th anniversary celebrations. December brings the antennas of the Atacama Large Millimeter/submillimeter Array (ALMA), set beneath the splendour of the Milky Way in the skies above. This image demonstrates the unsurpassed observing conditions experienced on the 5000-metre-high Chajnantor plateau, in Chile’s Atacama region. Yet another highlight is the calendar’s cover image itself — an infrared view of the Carina Nebula, a large, bright region of massive star formation in the southern skies, taken with ESO’s Very Large Telescope. Lunar phases are also indicated. You can see images of the individual pages here. The calendar measures 42 x 42 centimetres and has 14 pages, with a cardboard back. It is delivered in a cardboard box. The calendar is sold at 4.99 euros in the ESOshop, but the stock is limited. The expected shipping date is 15 November 2012. Order calendar or download pdf.